Match 25 of ICC World T20 was played at Bengaluru, Chinnaswamy Stadium between host India and Bangladesh. This match was India’s third match in the super 10’s stage. India lost to the kiwis and won brilliantly against the arch rivals Pakistan before this match. On the other hand Bangladesh lost their both the matches. They wanted some points on board to make it to the semis. In all important game Bangladesh won the toss and elected to bowl first. Openers gave India a steady start. it was going well until the 6th over. Rohit gave his wicket away to Mustafizur Rahman for just 18 runs. Few balls later Dhawan also lost his wicket to Shakib for 23 runs. India lost both openers after a cautious start. Virat and Raina were the two new batsmen for India. They both didn’t disappoint the Bengluru crowd. The duo shared a small partnership to rescue India. India needed a big partnership from these two. But Kohli gave his wicket away after hitting a big six, trying to repeat the same shot he was bold by Shuvagata for 24. India was in big trouble, Dhoni experimented with Hardik Pandya, as he was promoted up the order ahead of Yuvraj and Dhoni. But this time experiment failed. Pandya couldn’t play the role of pinch hitter. He was caught by the brilliance of Soumya Sarkar. India was in deeper trouble when Raina and Yuvraj lost their wickets in heap. It was captain cool Dhoni and Ravindra Jadeja who took India past 140 run mark. Jadeja was bold in the final over for 12 by Mustafizur Rahman. Dhoni was not out for 13 and Ashwin was not out on 5. India could manage only 146 runs in twenty overs. This was a disciplined bowling performance by the Bangla tigers. Mustafizur Rahman (2/34) and Al-Amin Hossain (2/37) were the pick of the bowlers for Bangladesh. Their effort with ball and field restricted India to below par score. Bangladesh started off the chase brilliantly. Tamim Iqbal and Mitun Ali were on the charge. But Ashwin was too good for Mithun. 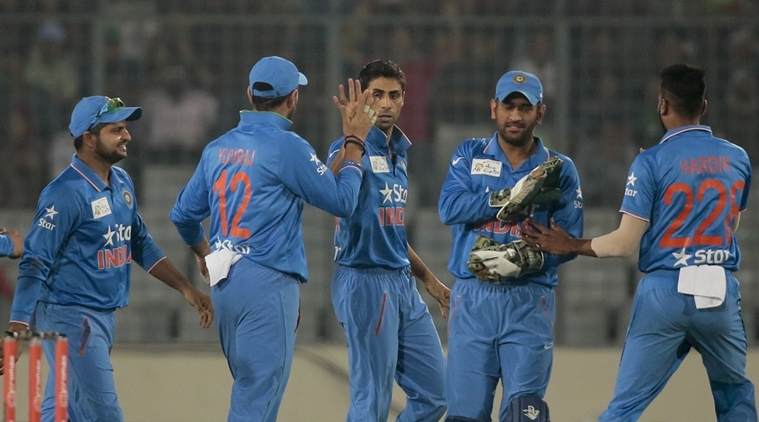 Bangladesh went well their chase; they were ahead of India at the end of powerplay. After the powerplay were done, Jadeja picked up danger man Tamim Iqbal for 35. Dhoni used Raina so well, he has proved why Raina is the regular bowler. Raina picks up Sabbir Rahman because of Dhoni’s brilliant wicket keeping. Rahman scored 26 off 15 balls. Few overs later Jadeja clean bolds Bangla captain Mashrafe Mortaza. But Shakib continued his run at the other end; it was very difficult to stop him. He was looking very good at the crease until Ashwin got rid of him for 22 runs. This game was perfectly swinging the situation. At times we taught Bangladesh will curse to victory but India was back in the game after picking up important wickets in regular intervals. And again it was Nehra, who gets a wicket of his full toss. He removes Soumya Sarkar for 21 runs. The over from Jasprit Bumrah was the best, he only concedes six singles in his last over. The equation for Bangladesh was 11 from the last over. Dhoni hands the ball to Pandya. We all taught that it was a wrong decision when Pandya gave 9 runs away in his first 3 balls, every Indian fan was disappointed, and they all thought its Bangladesh all the way. But some insensible batting by their experienced players like Mushfiqur Rahim and Mahmudullah gave India trilling win. Dhoni couldn’t finish the game with the bat in hand but, he contributed with a brilliant run out of Mustafizur Rahaman in the last ball of the match. Pandya concedes only 10 runs in his last over. That means India won a thrilling contest by one run at Bangalore. Ashwin, Jadeja and Nehra were with pick of the Indian bowlers. Ravichandran Ahwin was awarded the Man of the Match fr his bowling spell of 4 overs 2 for 20. India would be hoping to seal the semi final spot in their last game against Australia on 27th march at PCA Stadium, Mohali. And Bangladesh will look to win at least one match against the Kiwis on Saturday 26th march. The blackcaps are the first nation to qualify for the semi final in this edition of world T20 2016.